A return of a classic! Mattel brings back the classic game from 1996 in which the original battling robots try to knock each other's blocks off! Red Rocker and Blue Bomber battle it out in the arena, with realistic sounds and jaw-jolting action. 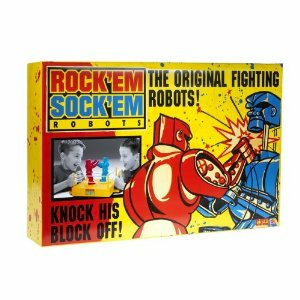 When a robot lands that blockbuster punch to his opponent's jaw, the victorious robot's head pops up with that Rock 'Em Sock 'Em "gotcha sound." Adult assembly required. Stadium measures 14.5"L x 10"W x 5.5"H.